Working with wood has a long-standing tradition here in South Tyrol. 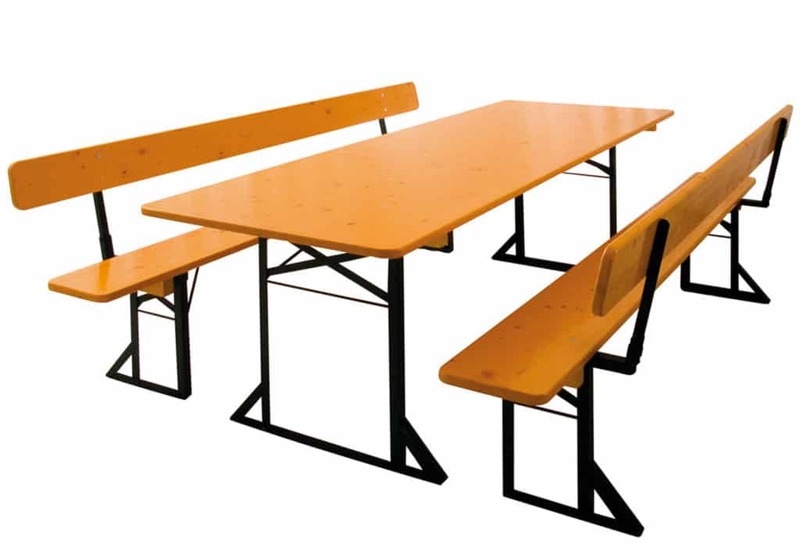 Our tables and benches QUALYLINE Premium – available in various models and sizes – are made of coniferous wood; boards, double-varnished on top and a frame of powder-coated iron guarantee the high stability, durability and longevity of this product. Available models: QUALYLINE Premium, QUALYLINE Classic, QUALYLINE Mini and QUALYLINE Garden. Varnished with special UV varnish, treated twice on the upper side of the board and once on the underside. The stacking laths are varnished and secured to the table with specialized wood glue and screws. The benches are also available with backrests on request. Varnished with special UV varnish, treated twice on the upper and the underside of the board. The stacking laths are varnished and secured to the table with specialized wood glue and screws. The perfect solution when space is tight. Made of coniferous wood, treated and varnished with specialized varnishes for the exterior. 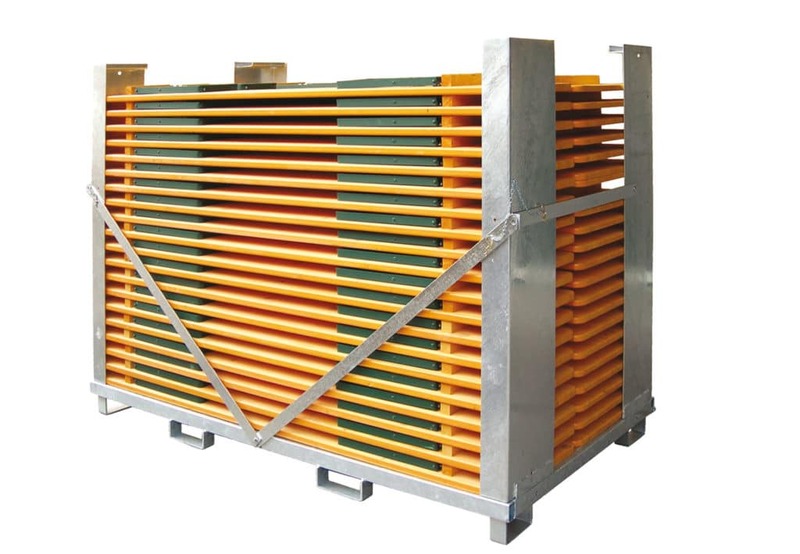 Economic use of storage space thanks to the foldable frame made of hot-dip galvanized steel. Made of coniferous wood, treated and varnished with specialized varnishes for the exterior. Curved backrest for greatest comfort. Minimum storage space requirement thanks to the practical folding mechanism. 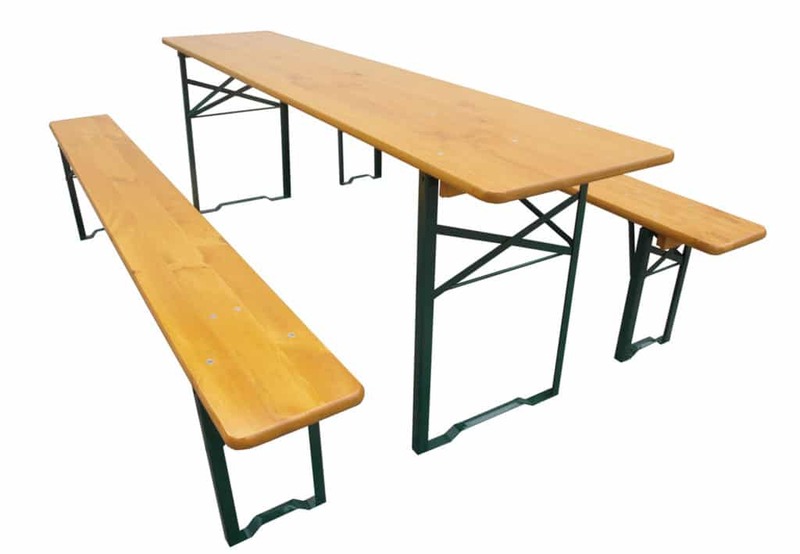 The thickness of the bench wood is 30 mm (PREMIUM Line) and 28 mm (CLASSIC Line), the table wood thickness is 25 mm (PREMIUM Line) and 22 mm (CLASSIC Line). 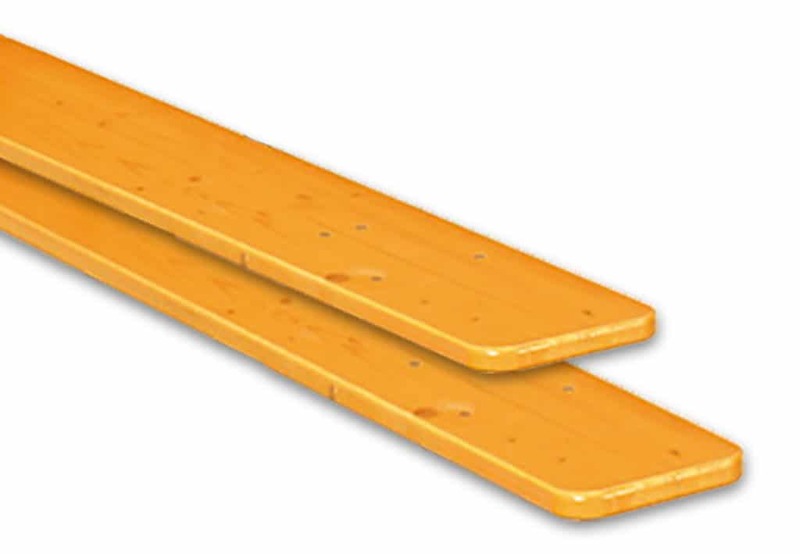 The standard length for the wooden boards for the tables and benches is 2,20 m (boards with 2,00 m length are made on request). 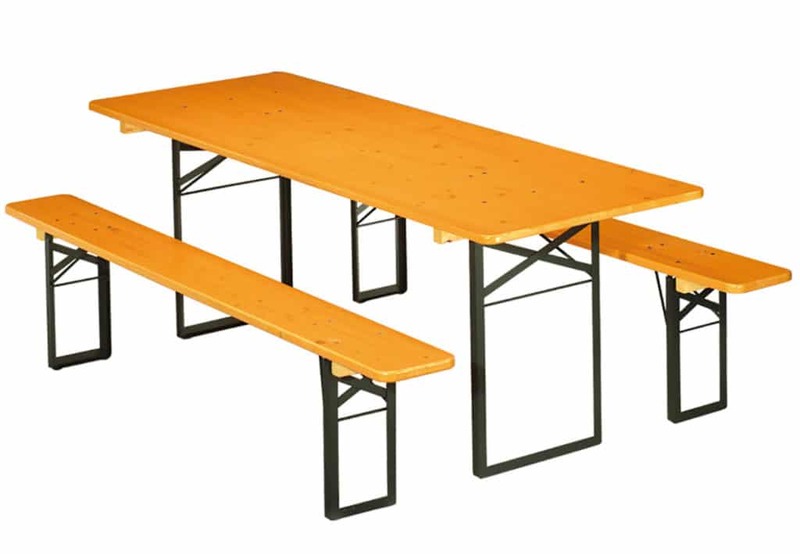 The height of the standing table is 77, 5 cm, uniform for all available measurements, while the standing benches have a height of 48 cm. The frames are mounted to the tables using galvanized bolts and stop nuts. The snap release mechanism to open and close the table is also galvanized. 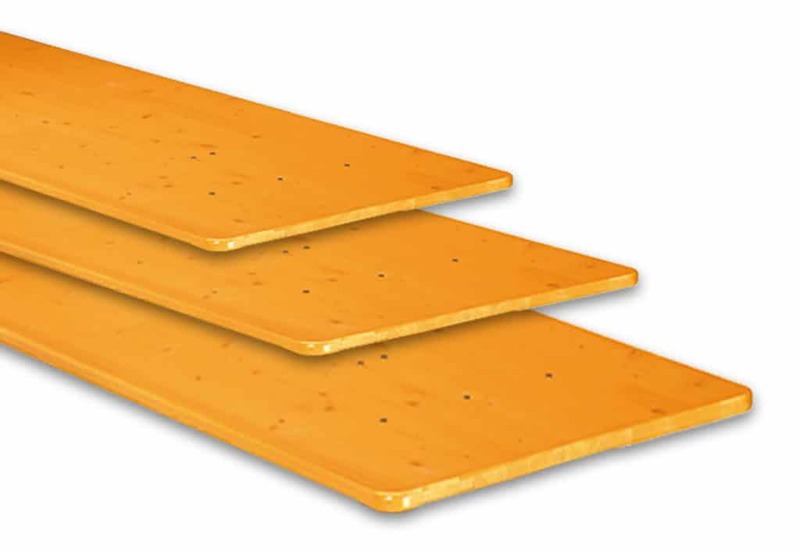 The stacking laths are fixed to the table boards with screws and specialized glue. 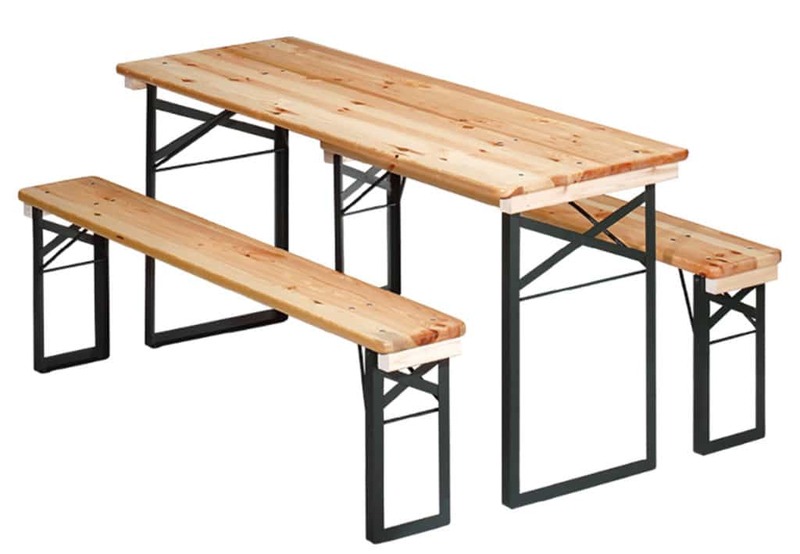 The table of the PREMIUM Line with a width of 80 cm is delivered with a wider base frame. The steel frame of the PREMIUM Line is constructed of angle iron profiles of 30x30x3 mm, which are bent into shape in a single piece without the use of welding.. 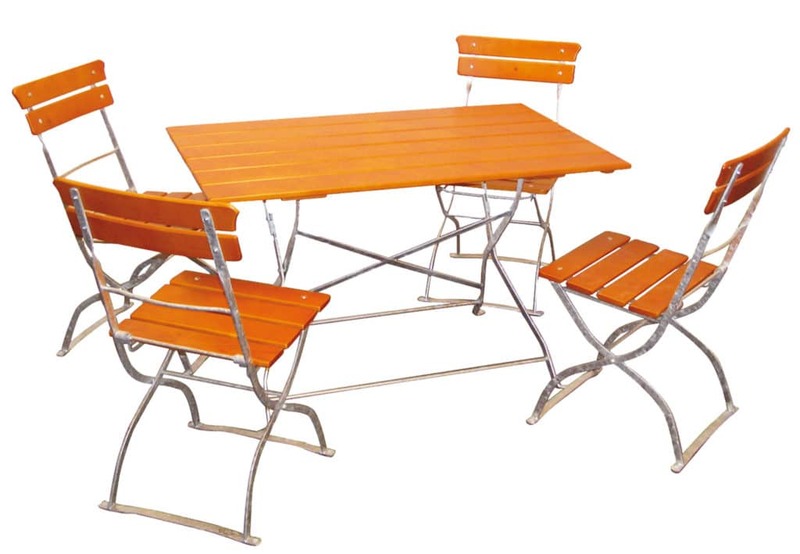 The hanger to lock the table in the open position is made of 10 mm strong round steel. The base frame is powder coated after the initial preparation. 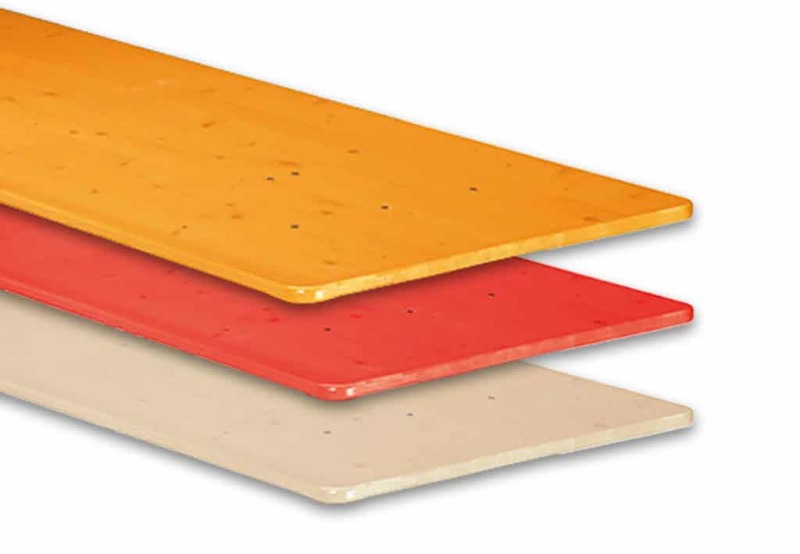 The base frame of the CLASSIC Line is made of 30x30x2,5 mm angle iron. 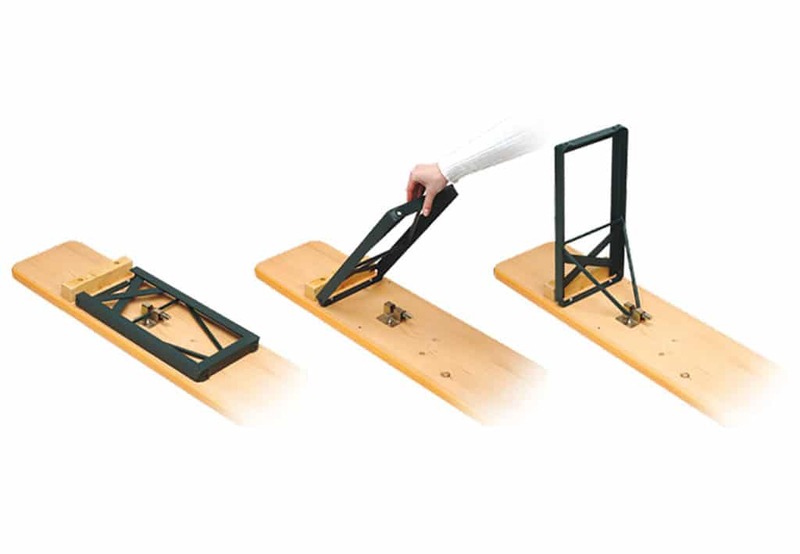 The hanger to lock the table in the open position is made of flat steel. After the initial preparation, the base frame is surface treated with an “immersion method” and then varnished. Available only for the series PREMIUM. The transport container in the standard size ensures space economic transport and storage of up to 20 tables and 40 benches. Transport containers for 15 and 25 sets are also available on request. The containers can be handled from all sides with a forklift or pallet truck.